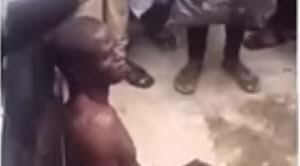 VIDEO: Man caught strangling woman in Lagos – Royal Times of Nigeria. A man suspected to be a hired killer was on Tuesday caught in the process of strangling a woman to death. It was gathered that the man, who was caught in the act at Jakande Estate in Lagos was sent from Sapele. Punch reports that the yet-to-be-identified man entered the woman’s shop and strangled her with a rope but was stopped by residents who heard the woman screaming. The video showed the man stripped, sitting on the floor and surrounded by a crowd. Another man in the crowd quickly narrated in Yoruba language that the man is a killer from Sapele who was caught trying to kill a woman in her shop. A policeman soon appeared in the video while the voice narrated the same story again. It was gathered that it took the police’s intervention to stop the crowd from lynching the suspect. The woman was reportedly taken to the hospital.